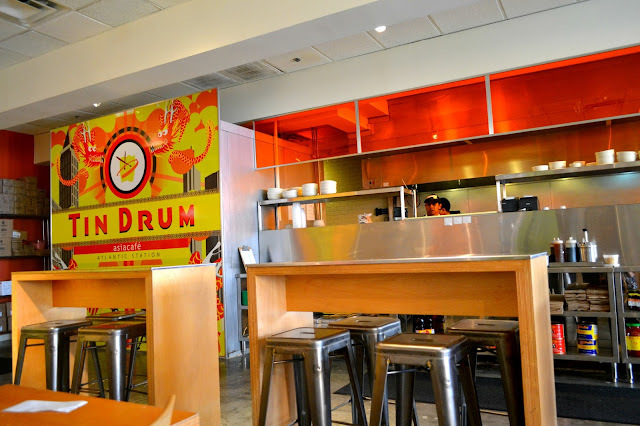 Tin Drum is a family-friendly restaurant featuring Pan-Asian cuisine, including Thai, Japanese, Chinese and Vietnamese made-to-order dishes. Tin Drum offers healthy yet delicious dining options, but also an energetic atmosphere for your little ones. Dine inside or outside on the umbrella covered open air patio and surround yourself with the hustle and bustle of Atlantic Station. Tin Drum cafes are designed to feel like a lively, bustling street-side cafe in Asia with edgy, urban and upbeat decor – a reflection of Steven Chan's childhood in Hong Kong. Steven Chan, Tin Drum's CEO grew up in Hong Kong and spent many afternoons admiring the vendors who made a living by feeding the people delicious & comforting food on the go. 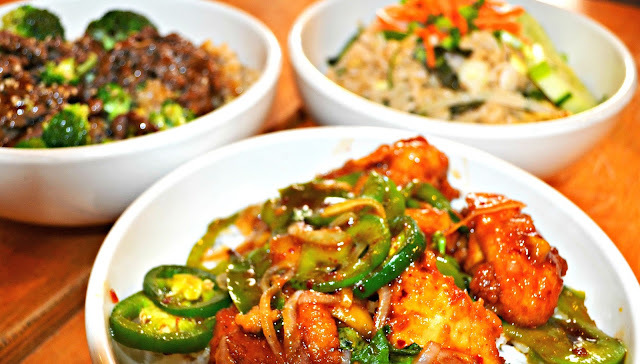 What I love about Tin Drum is all the different healthy menu options they offer. Tin Drum is certified by Healthy Dining Finder (www.healthydiningfinder.com) and offers guests a variety of menu options to manage their diets. 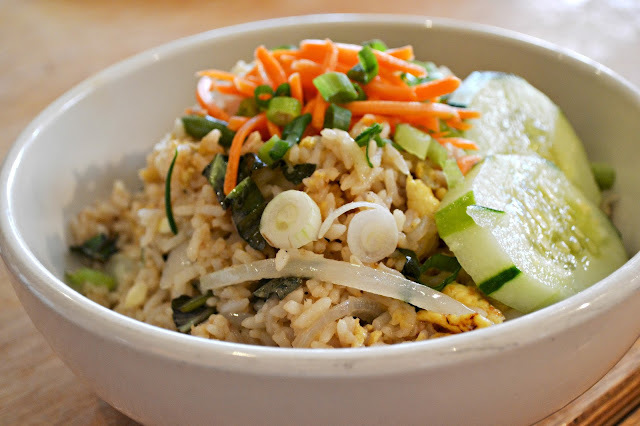 They serve the traditional fried rice, but also offer healthier alternatives such as white and brown rice. When it comes to drinks, Tin Drum offers an array of house brewed iced teas such as Traditional Black, Green Blackberry Jasmine, and Passion Fruit. They also offer organic juice, and fresh ginger ale. We had the opportunity to try the Mango stir fry. 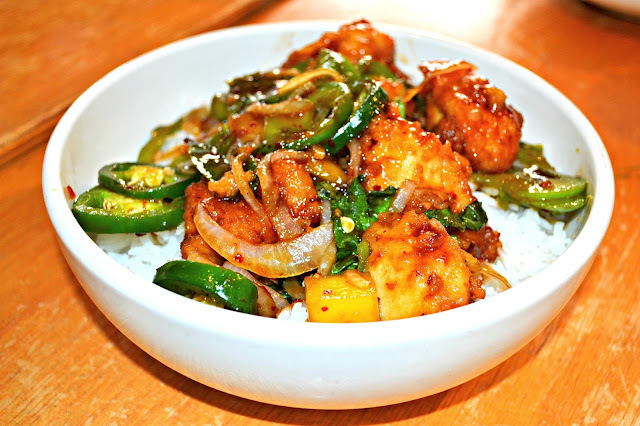 This dish is packed with sweet-chili sauce, fresh mango, basil, onions, bell peppers, jalapenos, crispy chicken, and steamed white rice. The mango stir fry is one of the chain best sellers and is the dish that is typically served in China during New Year. 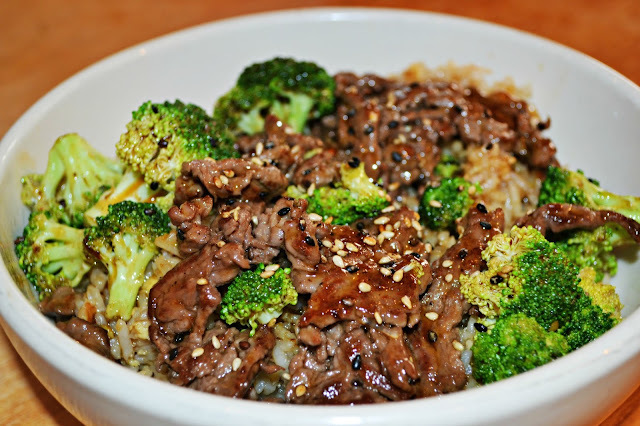 Next we had the beef stir fry, with sweet savory sauce, broccoli, sesame seeds, and fried rice. The flavor was just right- not too spicy or too sweet and the broccoli was not overcook. Last, we ordered the basil fried rice with a savory Thai sauce, basil, onions, scallions, jalapenos, green bean, carrots, sautéed chicken, and egg fried rice. If you don't like spicy foods, this is the perfect dish for you. Now, the real crowd-pleaser were the Crab n Cheese Spring Roll with sweet 'n' sour dip. Oh my dear lord I coud eat a whole basket if you let me. Just thinking about it makes me hungry! This is not your typical spring roll. These are super crispy, it almost feels like you are eating puff pastry and have just the right balance between crab and cheese. They are so good that people often comes just for this menu item. 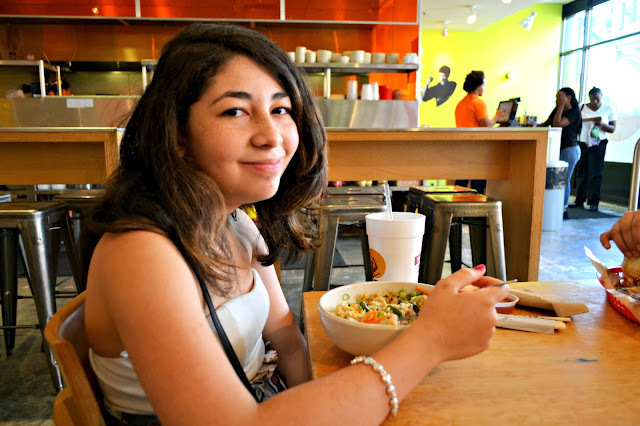 Tin Drum is raising money to support Share Our Strength’s No Kid Hungry campaign. 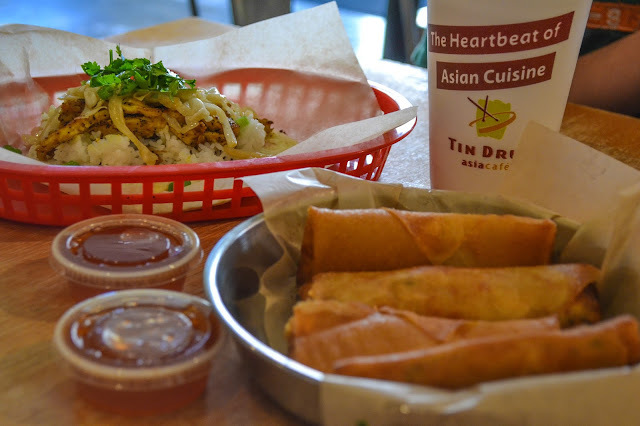 With 29% of kids in Georgia struggling with hunger, Tin Drum Asiacafé is helping Share Our Strength battle this issue that impacts our local communities. Tin Drum is supporting Share Our Strength’s No Kid Hungry Campaign mission to eliminate child hunger in America by donating $1 for every order of its signature iced tea, which is available in Traditional Black, Green Blackberry Jasmine or Passion Fruit. 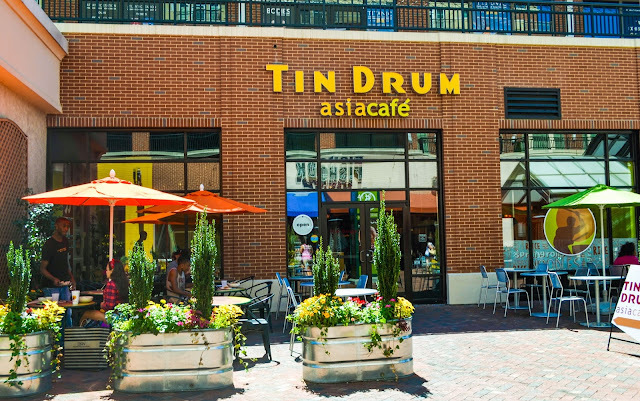 From September 23 to September 29, when you visit Tin Drum Asiacafé locations at Georgia Tech, Atlantic Station, Colony Square, Chastain Park, Dunwoody, Emory Village, Forsyth, Lindbergh, Roswell Market Place and GSU Downtown, Tin Drum will donate a dollar for every ice tea sold to Share Our Strength. Why? Because one in five children struggle with hunger in America, and as kids head back to school, many are returning to class hungry. 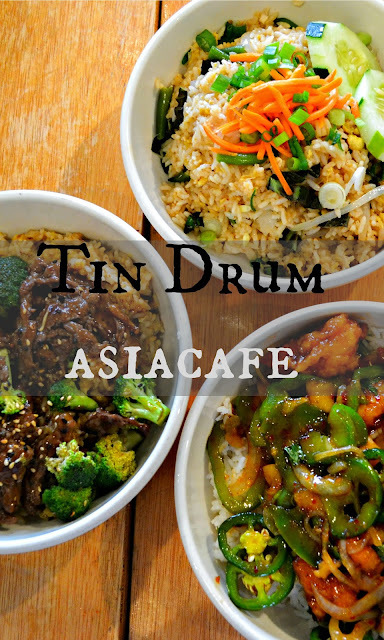 Tin Drum is giving the opportunity to one of our loyal readers to come to the cafe and try out their menu. All you have to do is leave us a comment (required or you will be disqualified). They only thing I ask in return is for you to take a friend or two during No Kid Hungry Restaurant week. This is a great way to give back to our community and help eradicate hunger once and for all. Share Our Strength’s Dine Out for No Kid Hungry is a national fundraising event that brings together thousands of restaurants. Tin Drum is proud to join the campaign to help raise funds and awareness so no child in America goes hungry.